We know it’s dark when you wake up and dark when you leave for work so why would you want to cook?! You just want to get home, rest and maybe watch something tucked in bed! So what meals are quick, easy and cheap to cook but you’re still left feeling satisfied after? 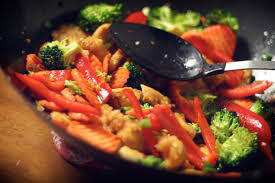 Chicken stir fry is great for cooking as a huge dish and separating over a few days and it just involves; chicken, egg noodles, vegetable & soy sauce! Baked potatoes just take 7 minutes in the microwave (if you’re not picky on microwaves over oven-cooked!) after piercing several times then simply cut in half and add your filling. Beef stew is perfect for cooking as a huge dish and having over a period of days and it’s perfect for keeping you warm this winter! Chilli Con Carne is another winter favourite and again, you can cook it but eat it for a few lunches during the week!